Honda is known for being the first to market with new technology, and their power equipment division is no exception: their top-of-the-line HS1336iAS is the only hybrid snowblower on the market. While the word “hybrid” may bring to mind fuel-sipping cars, adding electric power does more than conserve fuel. Adding electric propulsion gives this walk-behind the power to replace a tractor-operated PTO snowblower and makes it easier to use than just about anything on the market today. 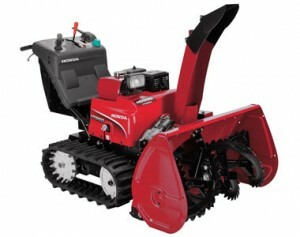 This snowblower is powered by an iGX390, an electronically-controlled version of Honda’s popular GX series of commercial engines. It has an Electronic Control Unit like a modern car engine with a self-tuning regulator that adjusts throttle and RPM automatically to match load and speed demands. It also allows drive-by-wire remote control and automatic choke, eliminating the need for two control cables. Coil-on-plug ignition provides more power and lowers fuel consumption, while the GX’s standard features including low friction components and low noise muffler carry over. Starting is as simple as turning on the ignition and pushing the start button. There’s no choke or throttle to adjust, and the on-board 24-volt electrical system has no problem turning the engine over. This isn’t a hybrid system like you’d find in a car. Instead, the engine directly powers the augers and generates power for a pair of electric drive motors. 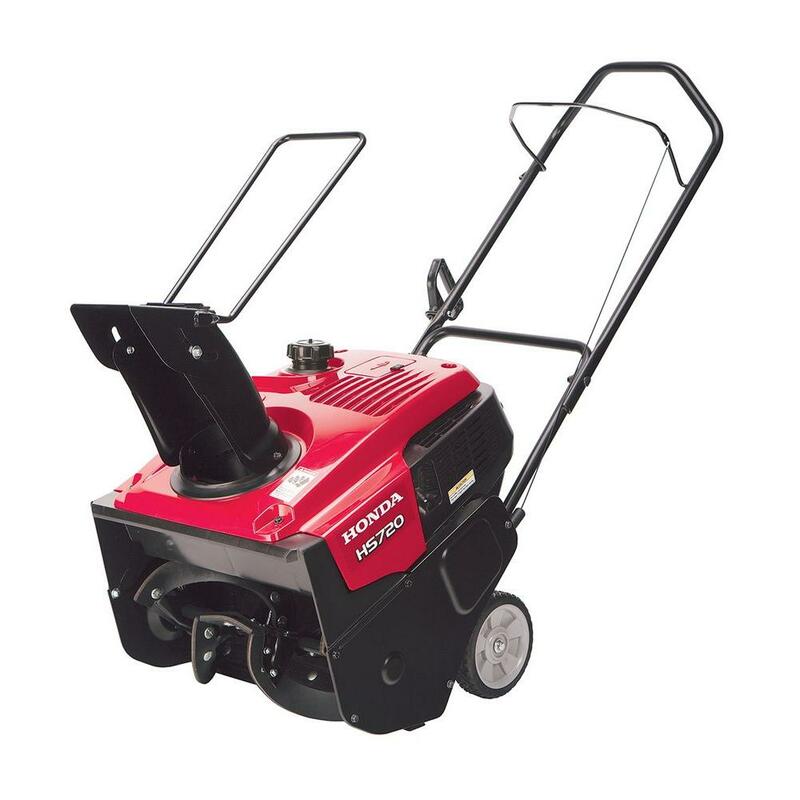 These motors provide maximum torque as soon as they start turning to push into thick accumulation, and they have sensors that can automatically adjust speed to get maximum snow clearing performance without bogging down. 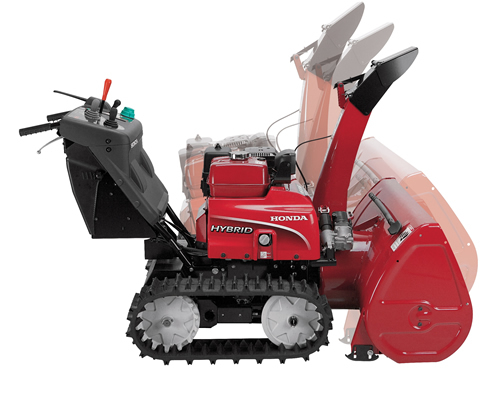 By connecting these sensors to the electronic control system on the engine, Honda has been able to create an easier way to control the snowblower’s speed. Using a lever next to the handles, the operator can choose from manual, semi-auto or automatic speed control to best fit operating conditions. In automatic, the snowblower controls the forward speed and throttle automatically for the best performance, picking up the maximum amount of snow without bogging down. 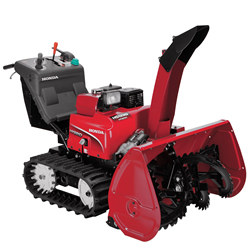 In manual mode, throttle and speed are controlled by the operator like a regular snowblower. Semi-auto hands throttle speed control off to the snowblower with the operator dictating the speed to make it easier to operate in tricky areas like slopes and iced-over pavement. The advantages continue with the engine off. The motors can operate solely off of the batteries, making this snowblower easy to transport. The main auger is 36 inches wide and can handle snow up to 22.8 inches deep at a rate of up to 3,000 lbs. per minute. Teeth on this auger help it bite into hardpacked snow. The second auger pushes snow through a double-hinged chute provides a smooth curve for more precise control of where the snow lands. The position of the auger is electronically controlled using a joystick on the control panel. Maximum throwing distance for the chute is 62 feet. The HS1336iAS has a unique power lift and tilt system for the auger housing for increased stability on hills, letting it go places that would normally require a tractor-based snowblower. As expected in this market, Honda makes a storage cover and a drift cutter for this model. There’s also a cold weather cab to protect the operator from snow and wind. Getting parts and accessories for the HS1336iAS is easy: just visit www.hondalawnparts.com. We’re a certified Honda Engines and Honda Power Equipment dealer, which means we can ship the full range of Honda OEM parts to your doorstep, no matter where you live in the U.S. or Canada. Not quite sure what you need? Our search engine makes finding parts simple by including factory diagrams and descriptions.